Manufacturer of a wide range of products which include meditation pillow, meditation accessories, meditation mats, crescent cushion with cotton filling, crescent cushion with buckwheat filling and meditation cushion. To shield your eyes from light and to apply a gentle relaxing weight over and around the eyes, use our Meditation Pillow. Pillows made from fabric such as cotton or silk and filled with Lint Seeds and Lavender Scented which helps in relaxing tired eyes. The best quality eye pillows are available in market. Fabric Cotton Covering with buckwheat filling. The Zafu offered by us is a round shaped meditation cushion having pleated sides. These cushions are designed and made to give high level of comfort and stability during the practice of your yoga or meditation. The Zafu that we offer you are densely filled with 100% cotton and are used as a solid cushion. These Zafu Meditation Cushions have small zippered openings neatly hidden between the plates that help you in removing the cover at the time of washing. We offer these Zafu Cushions in a vast range of colors, textures, sizes and designs. Color Red, Blue, Green, Black, Orange, Purple, Grey, Cherry, Pink and etc. Owing to years of experience, we are engaged in manufacturing, supplying and exporting a huge variety of Crescent Cushion. 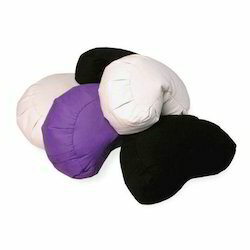 These soft and durable cushions are delivered within the prescribed time frame in safe packaging. These cushions are known for their fine finishing and high strength. Owing to years of experience, we are engaged in manufacturing, supplying and exporting a huge variety of Crescent Cushion. Our Crescent Cushions are suitable for all type of posture. These cushions are known for their fine finishing and high strength. 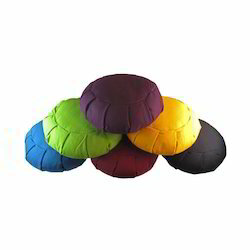 We are manufacturer, supplier and exporter of Meditation Cushion. 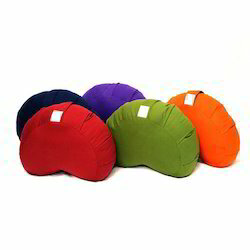 These comfortable cushions give relax to the people, who do meditation for long hours. With the help of our professionals. Our Acupressure Mats works on acupuncture points. 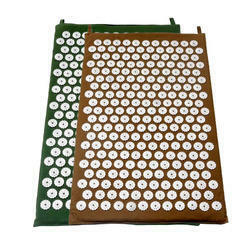 Acupressure Mats applies pressure on acupuncture points with the aim of clearing blockages in meridians, through which energy flows. All varieties of mats are clinically approved and tested. 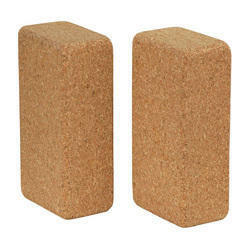 We are one of the leading manufacturers and suppliers of premium quality Cork Yoga Blocks in India. Cork is stable, durable & eco-friendly for yoga practitioners and comes in a variety of colors & sizes and are made up of 100% Virgin Fresh Material. Moreover the material is water resistant so it stays durable and looks new for a longer period of time.